Gottfried August Bürger was the son of a country priest. In 1764 he started studying theology in Halle because his grandfather wanted him to. In 1768 he was allowed to study law in Göttingen. There he read French, English, Italian and Spanish poems from the past. He befriended Heinrich Christian Boie, who helped him to a job as steward in Altengleichen. He held this position from 1772 to 1784. In 1774 he married Dorothea Leonhart zu Niedeck. After he fell in love with her younger sister Augusta they lived in a Ménage-à-trois. In his poems he referred to Auguste as Molly. In 1782 he had a child with Molly. After his wife's death he moved to Göttingen and in Jun 1785 he married Molly. But she died on 9 Jan 1786 and this threw him into a crisis and diminished his literary output for a long time. In 1789 he was appointed associated professor by the university, but this didn't bring him a steady salary. In 1790 he married Christina Elise Hahn, who was 21 years his junior. They had a disabled son in 1791. His wife was unfaithful to him and on 31 Mar 1792 they were divorced. In 1791 Friedrich Schiller had criticised his poems anonymously but severely in "Allgemeinen Literatur-Zeitung" and this harmed his self-confidence. He started working as a translator. But his health was failing. He lost his voice and couldn't lecture anymore. In 1794 he died in Göttingen. He is now mainly remembered for his "Feldzüge und Abenteuer des Freiherrn von Münchhausen" (1786/1789). 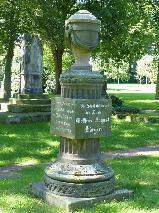 The grave of Gottfried August Bürger at the Bartholomäus-Friedhof, Göttingen.